This replaces the Fed’s statement from six weeks ago, which was that they expected to continue the ZIRP “for a considerable time after the economic recovery strengthens” and said they thought the ZIRP would continue at least through mid-2015. I think the new policy is better, first of all because it’s specific. Of course they’re going to raise rates when the economy’s better, but how do they define better? They just told us — 6.5% unemployment (it’s now 7.7%). The euro has always struck me as Germany’s final success at dominating Europe. What two world wars couldn’t accomplish, the Bundesbank could. By the 1990s, Germany looked like such a model of economic rectitude that eleven of its neighbors and near-neighbors (now 16, not counting principalities) were happy to formally link their currencies to Germany, their monetary policies to a European Central Bank that was a continental version of the Bundesbank, and their fiscal policies to a treaty that said deficits and debt should be under 3% and 60% of GDP (which seemed to reflect German fiscal conservatism). The news for much of this year has been of sovereign debt crises in Greece and the other “PIIGS” countries (from the “BAFFLING PIGS” mnemonic for the first 12 euro members), Portugal, Ireland, Italy, and Spain. But the most shocking economic news for me this year was the recent report that they held a German bond auction and “nobody” came. Not really nobody, but the German government was only able sell three-fifths of the “bunds” they intended to sell. To be sure, they’d have sold more if they’d been willing to accept lower bids; these bonds were supposed to pay just 2% interest, and that’s about where the yields ended up. The linked article quotes some observers who say the weak auction was due to investor concerns that Germany might be left holding the bag for PIIGS and other euro countries that can’t pay their debts. Others have said it was mostly about currency risk, i.e., the risk that the euro might massively depreciate or even crack up over the 1o-year lifetime of the bonds. ‘The path of the euro zone is becoming clear. As conditions in Europe worsen, there will be fewer euro-denominated assets that investors can safely buy. Bank runs and large-scale capital flight out of Europe are likely. ‘Devaluation can help growth but the associated inflation hurts many people and the debt restructurings, if not handled properly, could be immensely disruptive. Some nations will need to leave the euro zone. There is no painless solution. At least the run on the euro is off to a slow start. The euro has had a rough November, but its decline against the dollar was only four and a half cents, or about a penny per week. The euro’s price against the dollar is still higher now than it was in most of 2005-2006. As has been noted, euro membership has arguably gone from a privilege to a bane for these weaker countries, and possibly for all of them. Before the recession, their governments and firms could borrow cheaply on the international market, as the relatively stable euro provided insurance for the lenders, against getting repaid in devalued currency. But now euro membership takes away two key stabilization tools for them: monetary stimulus from their own central bank, and currency adjustment (a devaluation could help GDP through increased net exports). The messy euro situation looks like the big wild card for the U.S. economy. (Here the conventional wisdom is actually correct, in my view.) Although the blow to U.S. exports from a double-dip European recession could theoretically be offset by more expansionary fiscal policy, the political prospects for additional stimulus have been dim for a long time. Things would have to get a whole lot worse here before any new stimulus could get past the Republicans in Congress, and maybe not even then. Count me among the skeptics who believe the Fed has pretty much already done all it can to pull the economy out of the deep hole that it’s in. Zero short-term interest rates, purchases of longer-term bonds to keep long-term rates at historic lows, backstopping various asset markets, emergency loans to banks, etc. It’s helped avert a Second Great Depression, which is nothing to sneeze at. Some economists who I usually agree with are convinced that aggressive new policies could pull us out of the current Little Depression, too. They’re smarter than I am, but they have yet to convince me that these policies could work. Another popular tonic is a higher inflation target. Right now the Fed’s unofficial but almost universally acknowledged inflation target is 2%, and for the past few years the core inflation rate has been below or near 2%. When inflation is very low, real interest rates (nominal interest rates minus inflation) can still be high even when nominal rates are also low. In the U.S. in the early 1930s, for example, nominal rates plunged toward 0%, but deflation was raging, so real interest rates were actually quite high. Economic historian Nick Crafts, in a Financial Times op-ed, says that Britain’s recovery from the Great Depression was greatly aided by a combination of low nominal interest rates and rising inflation rates — i.e., negative real interest rates — which promoted homebuilding. Crafts says targeting a higher inflation rate — say, 4% — could do the trick today. Again, I just don’t see how you get there. Would I like to see lower real interest rates? Sure. But for 4% inflation to happen, a lot of other things have to happen first. Banks need to loan out their excess reserves, people and businesses need to buy stuff with those loans, the money needs to be redeposited in banks, more loans need to be made, etc. That’s how monetary policy works — when it works. 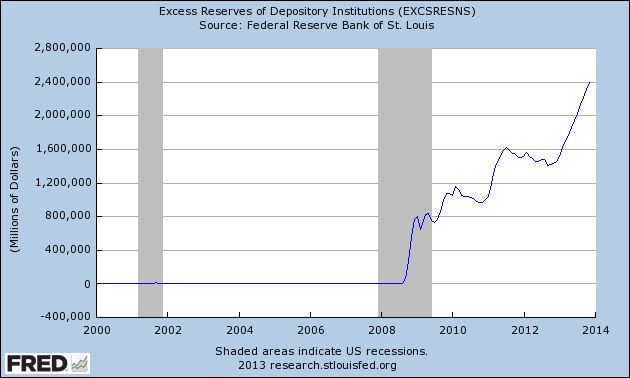 Right now, the banks have over a trillion dollars in excess reserves that they’re just sitting on. 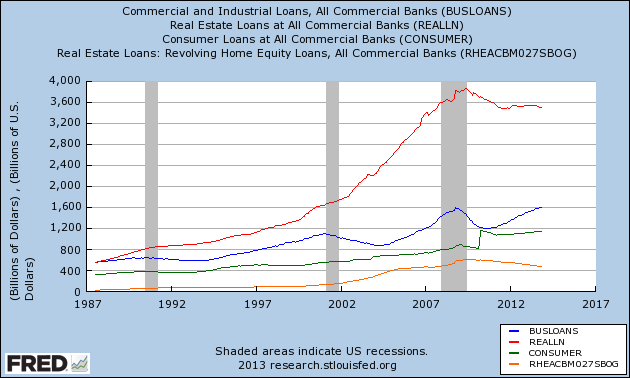 Banks are not eager to lend, and businesses and households are not eager to borrow. Classic liquidity trap. Nominal GDP targeting and higher inflation targets sound radical, but are they? Chicago Fed President Charles Evans said in a speech this week that he viewed the 2% inflation target as a medium-run target, not a short-run target, saying that as long as inflation averaged out to 2% over a multi-year period, higher inflation rates would be acceptable in the short term. That statement is consistent with either a nominal GDP target (shoot for low inflation when real GDP is high, tolerate higher inflation when real GDP is low) or an inflation target (let inflation rise when unemployment is high), which suggests that neither of those policies is all that new. Both seem to promise much more than they could ever deliver.